Be the first to share your favorite memory, photo or story of Mack. This memorial page is dedicated for family, friends and future generations to celebrate the life of their loved one. HILLSBOROUGH: Mack L. Vickers, Jr., 78, passed away Monday, October 29, 2018 at the Hospice Home of Alamance-Caswell. He was born in Durham, the only child of the late Mack L. Vickers, Sr., and Alma Herndon Vickers. Mr. Vickers was owner and operator of Vickers Clothiers in Durham. He was a 1958 graduate of Southern High and he also attended Elon College. 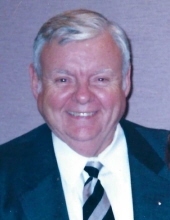 He was a lifelong member of Berea Baptist Church and was a member of The Gideons International, joining in 1981 and working for many years as State Chaplain and Membership Coordinator. He was also a 32 degree Mason with the Masonic Lodge #352. He worked for the Young Men’s Shop for 10 years before starting his own business. He started Vickers Clothiers, in Wellons Village in 1972. He then moved the business to Hillandale Road, Loehmann’s Plaza and focused on big and tall men’s clothing until his retirement in 2006. Mr. Vickers is survived by his wife of 59 years, Juanita Brantley Vickers; sons, Richard Alan Vickers (Lorraine), Aubrey Barrett Vickers; grandson, Brian Alan Vickers; sisters-in-law, Correen Harris, Corrinia Brantley; nieces and nephews, Page Brantley, James Brantley (Robin), Dianne Mathis (Charlie), Tony Harris, Douglas Glenn (Tracey), Donna Goss (Randy), Billy Ross Williams (Edith) and daughter Jennifer; beloved cousins, Mae Wynne (Marty Smith), Harvey Wynne (Janet), Margie Weatherington; and other extended family. A funeral service will be held 2 p.m. on Thursday, November 1st at Berea Baptist Church with Rev. Philip Mumford and Dr. Robert Wortham officiating. The family will receive friends prior to the service from 1 to 2 p.m. at the church and at other times at the home. Burial will follow the services in Maplewood Cemetery with Masonic Graveside Rites. Pallbearers will include Johnny Byrd, David Hutson, Dennis Massey, Jeffrey Massey, Jesse Matthews and Brian Vickers. Flowers will be accepted, or memorial contributions may be made to The Gideons International, Durham South Camp: P.O. Box 2155, Durham, NC 27702; or Berea Baptist Church: PO Box 110343, Durham, NC 27713. To send flowers or a remembrance gift to the family of Mack L. Vickers, please visit our Tribute Store. "Email Address" would like to share the life celebration of Mack L. Vickers. Click on the "link" to go to share a favorite memory or leave a condolence message for the family.